4.0 out of 5 based on 37 bloggers and 9 commenters. 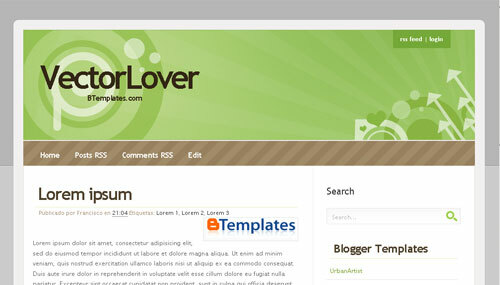 VectorLover is a free blogger template with 2 columns, right sidebar, web 2.0 design, rounded corners, girly looking, geometric motifs and vectorial elements. Excellent template for blogs about fashion or love. Lovely! Wish it came in 3 columns. I uploaded to my “true” blog and lost the ability to post comments. The icon is gone, and I can’t get it back. Suggestions? ecelente theme… gracias… arigato ..! i like this theme, i am using in to my web site, thnxxxx.